The headline-grabbing Swiss Alp watch has taken a horologically unexpected turn this year, its rectangular case now with a movement from sister brand Hautlence, inside it. 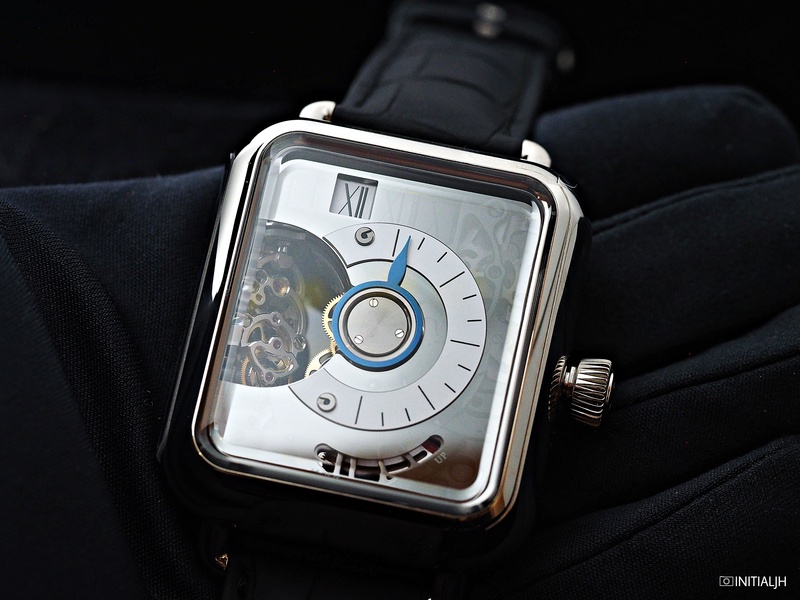 Meet the rather cool Swiss Alp Watch Minute Retrograde. The white gold 48mm case has the same rounded corners and curved sapphire crystal now familiar as the Swiss Alp Watch design. This limited edition (ten pieces) model is, like other Moser pieces, a combination of old with the new, featuring a Grand Feu enamel minute ring, half-trailing hours, and a flame-blued retrograde minute hand. The hours driven by a twelve link chain and hinged pallet system controlled by a speed regulator, with an hour change that is not instantaneous, but takes a few seconds. Behind all of this is the double barreled automatic Hautlence Calibre HL2.0, which beats at 18,000 VPH and has a 45-hour power reserve, displayed on an indicator at 6 o’clock. The escapement and hairspring are made by Precision Engineering AG, a sister company of H. Moser & Cie. and Hautlence. The hand-finished movement has an 18 carat white gold off-centre rotor, anthracite ruthenium coating, and mirror-polished steel. An important thing to note is that that the angle at which you look at this watch matters. The use of a smokey sapphire crystal as the base onto which the enamel ring and hand are placed means that its opacity varies according to the angle at which light hits the dial. Which makes for an interesting watch to photograph. The Swiss Alp Minute Retrograde comes on a hand-stitched black alligator strap but you also get a second one in beige kudu leather with a green leather lining, now a touch synonymous with Moser. The Swiss Alp Watch Minute Retrograde is the second Hautlence and H.Moser & Cie collaboration. The first was the Hautlence Tourbillon 01 (2015), which used the Moser Calibre HMC 802.